Cristus surrexit vere, sicut dixit! Alleluia! 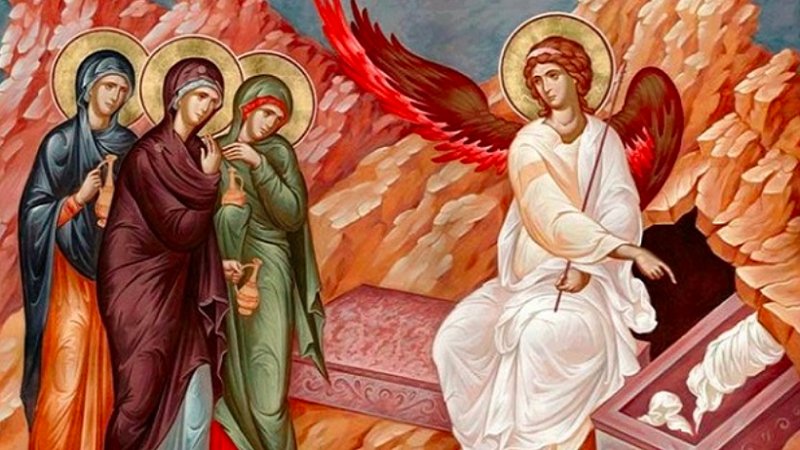 At that time, Mary Magdalen, and Mary the mother of James, and Salome bought sweet spices, that coming they might anoint Jesus. And very early in the morning, the first day of the week, they came to the sepulchre, the sun being now risen. And they said one to another: Who shall roll us back the stone from the door of the sepulchre? And looking, they saw the stone rolled back. For it was very great. And entering into the sepulchre, they saw a young man sitting on the right side, clothed with a white robe, and they were astonished. Who saith to them, Be not affrighted; ye seek Jesus of Nazareth, who was crucified: He is risen, He is not here; behold the place where they laid Him. But go, tell His disciples, and Peter, that He goeth before you into Galilee; there you shall see Him, as He told you. Down in Rome for a few days. Here's some pics of adventures so far. A feast for Easter morning. 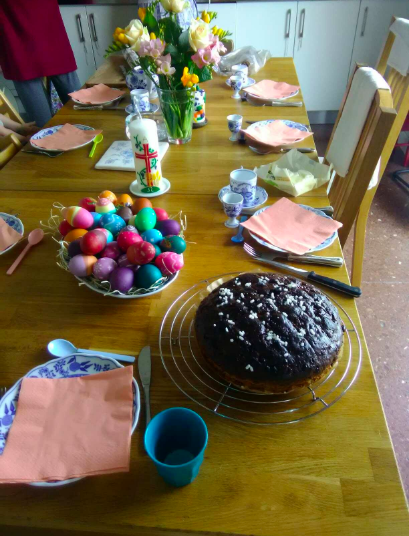 Staying with friends who have four little kids and it was a delight to see them searching the house for chocolate eggs and rabbits. 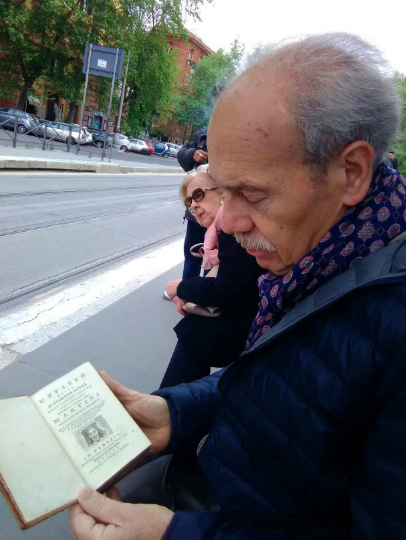 This Roman gentleman was getting the tram toward the centro this morning as I was off to the Mass. 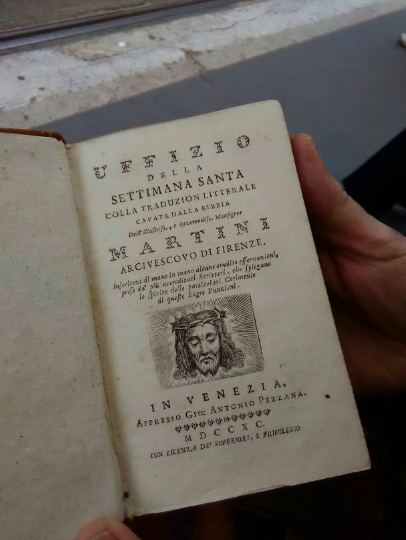 He'd just been to Porta Portese market, (every Sunday, Easter or not) and bought this beautiful book and allowed me to take a picture of it. 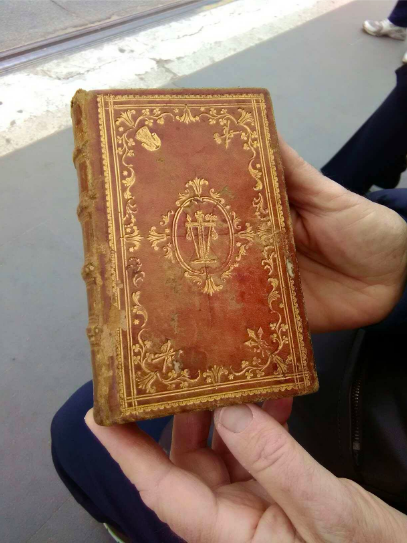 The Divine Office for Holy Week, published in Venice MDCCXC, which is 1790. He told me he'd got it for 30 Euros. I said it was a great treasure. I pulled my missal out of my bag and said I was going to the Old Mass, in Latin. He seemed surprised and said, "But you are so young!" 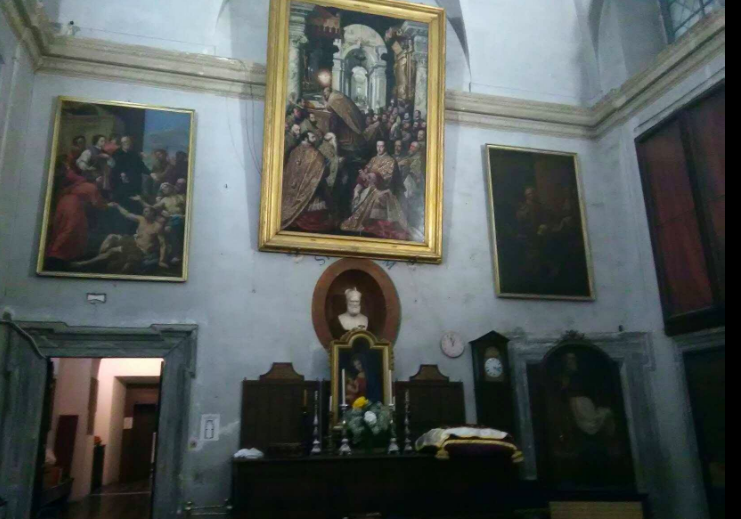 One of the side chapels at Santissima Trinita dei Pellegrini, the FSSP parish in Rome, has one of the very few contemporary paintings of St. Philp Neri as a young man. 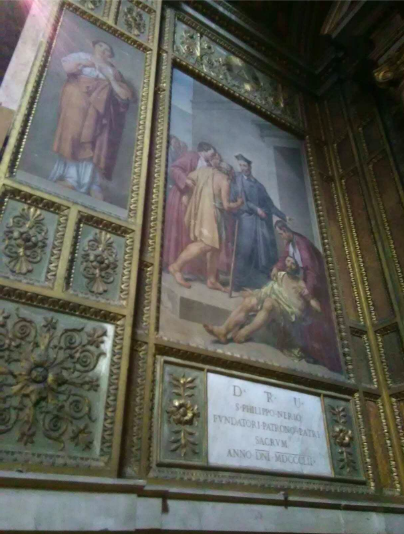 Here he is shown welcoming sick pilgrims and the poor in the hospital he founded for their care - which is where the church gets its name: "dei Pellegrini" means "for the pilgrims". The chaps in the painting wearing red robes with white collars are members of the confraternity who were entrusted with the care of the convalescent poor. This confraternity has recently been revived at the parish and is now flourishing with new members. They perform many spiritual and practical functions. St. Philip, the poor sick pilgrims and the confraternity as they are shown in the sacristy. 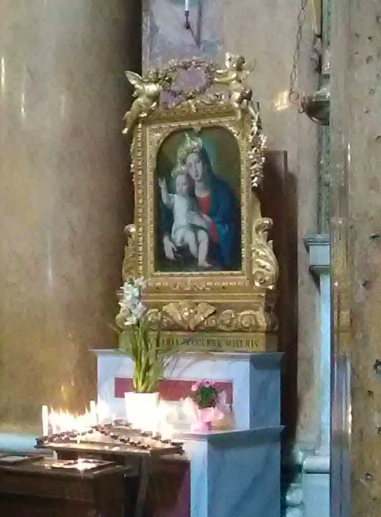 This little shrine to Our Lady was recently refurbished, and there was a queue of people waiting to pray here this morning, an encouraging sight. Baroque art and architecture is meant to fool the eye, to make you think it looks smaller than it is. 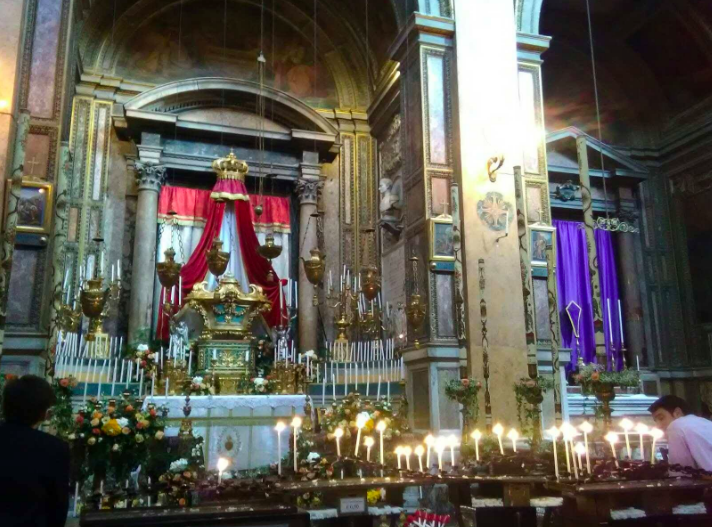 It is difficult to get an idea of the scale of that painting - the great masterwork of Guido Reni - but it might help to know that when new candles are put in the big gold candlesticks above the main altar, the whole thing reaches about 13 feet. At Easter the parish pulls out all their precious Baroque portrait reliquaries. 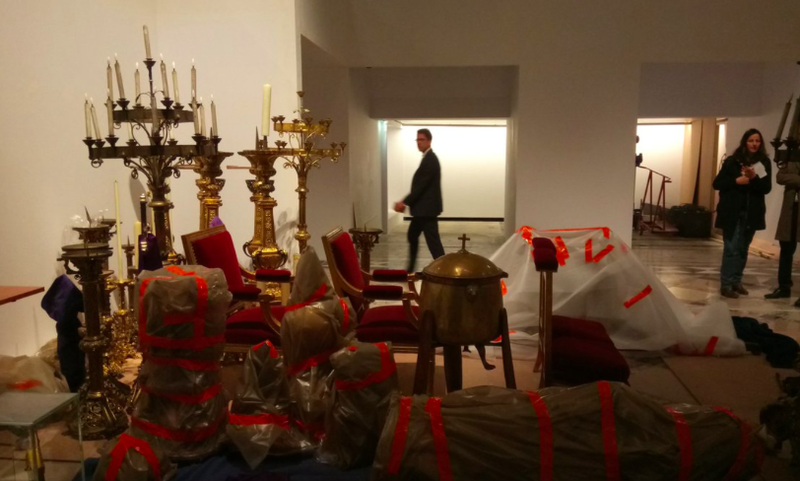 All those gold busts are gilded wood portraits of the saints whose relics are inside. My people, what have I done to thee, or in what have I grieved thee? Answer me. 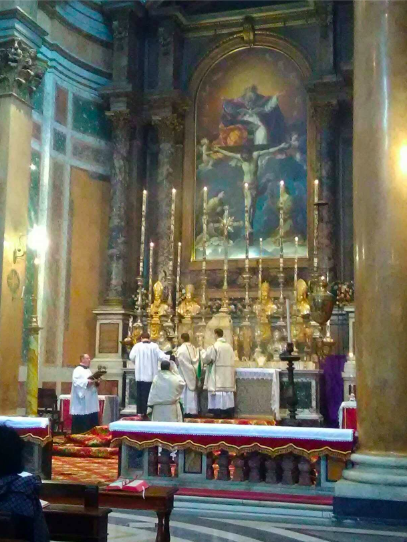 Sepulchre tonight, Santissima Trinita dei Pellegrini, Rome. Because I brought thee out of the land of Egypt, thou hast prepared a cross for thy Saviour. Because I led thee through the desert forty years: and fed thee with manna, and brought thee into a land exceedingly good, thou hast prepared a cross for thy Saviour. 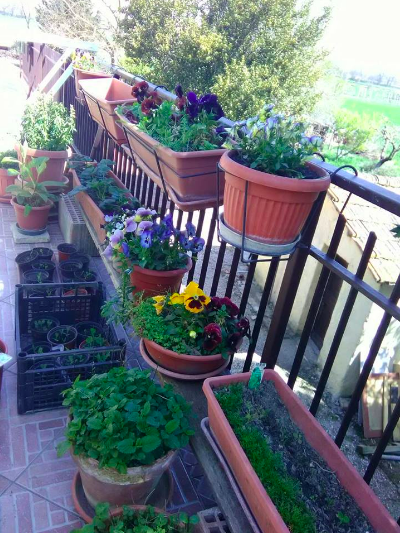 One of the major challenges of gardening in Italy is the super-duper heavy clay soil. In the mountains the problem is pretty much no-soil; most farms up there look like they're growing rocks. But down here in the Tiber valley the soil is really deep. I've dug down to try to find the substrate but it's impossible with just a spade. 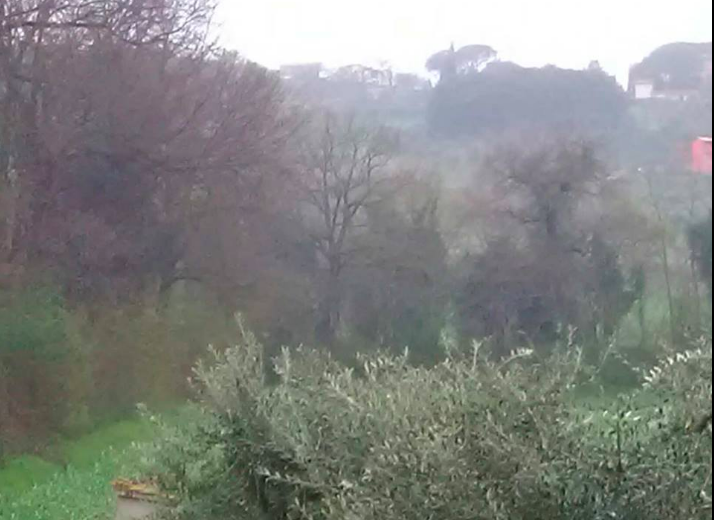 We are in the flood plain of the Tiber river and the soil is really just silt. 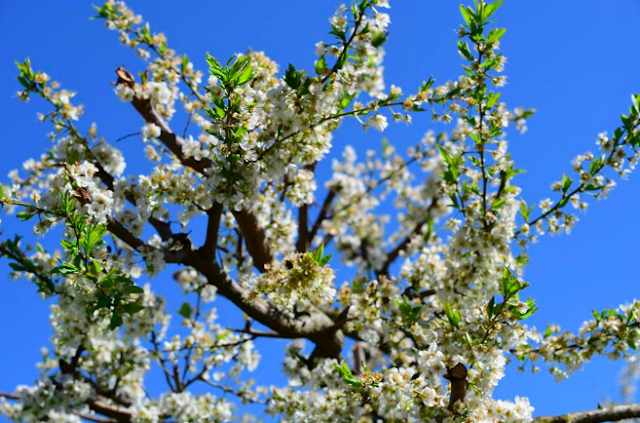 It's very good for growing, and has all manner of mineral nutrients, but though it's easy to work in the spring when there has been a lot of rain, it hardens into a dense grey brick in summer, and even in spring if there hasn't been a lot of rain (as there hasn't this year). It grows the usual staple Italian things quite readily and hardly needs any amending. Aubergine, tomatoes, peas, bush beans, tomatoes, artichokes, tomatoes, finocchio, tomatoes and tomatoes do brilliantly. We have a lot of vineyards around here too, and the climate is good for olives. Also tomatoes. Onions do well, but other types of less determined root veg really struggle. Carrots, parsnips, beetroot just can't push through the dense soil. 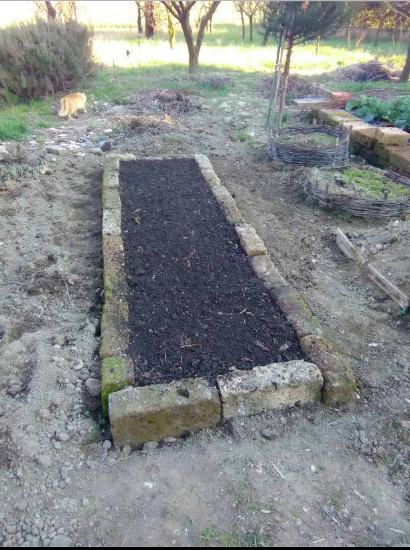 So my solution is raised beds and hugelkultur, basically layering composted and fresh organic matter with the clay soil and the compost-soil that comes from Annamaria's 100-year old family compost pile. I also liberally seeded white clover, which is a good green manure and nitrogen-fixer. Something I've noticed is that when I came the garden was a moonscape. I called it The Big Dry Patch, 200 square meters of compacted clay on which absolutely nothing grew but a few trees. 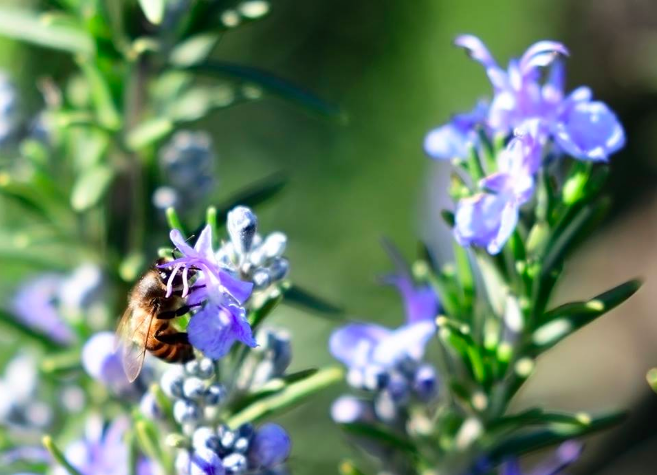 Annamaria's family have worked it for a long time, most of the 20th century, and the standard contadina method is just roto-tilling and planting directly into the ground. This works as a temporary, that is single-season fix, but destroys the soil's natural substructure - all the little tunnels made by worms and beetle grubs and fungus mycelium. So when you till it and then let it settle down, it compacts into a brick, which the sun bakes hard. When I started digging in it, I hardly ever saw a single worm and there was not a great deal of organic matter in the soil. Since then I've been building raised beds, the floor of which are just the native soil, and there has been an almost miraculous transformation. In just two seasons the moonscape is gone, and there is green everywhere. And everywhere I put a spade in, I'm not only finding worms, but those super-duper big fat ones. In one of the little round raised wattle beds, I was planting pepper plants from the garden centre last summer, and there were so many worms it was difficult to find a clear spot to put a trowel in. I think I'm going to start vermicomposting next. I have to move next year, and I really want there to be a legacy here of greatly improved soil quality and useability. 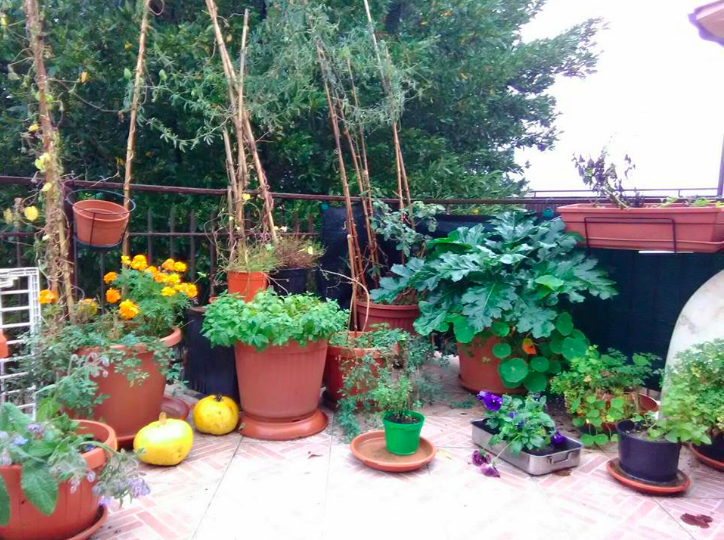 I'll be very sorry to leave it all, but having a really big garden has provided an opportunity for a kind of graduate course in organic gardening and soil management. First thought this morning, and spoken aloud, "Well... 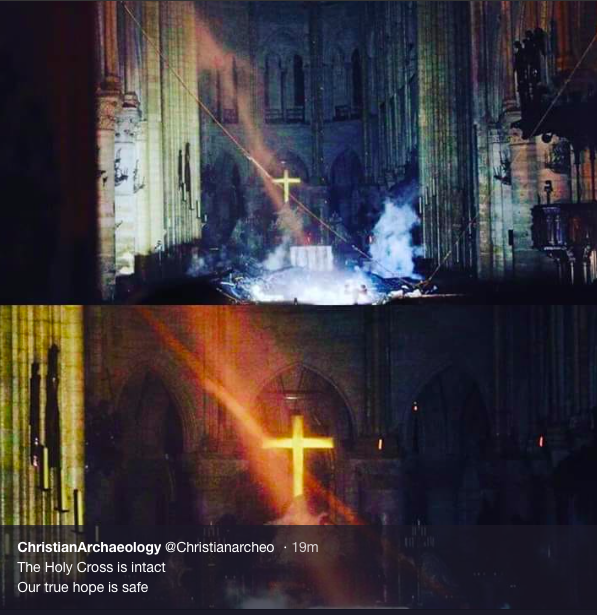 I guess we should find out what's left of Notre Dame." And the news was less bad than expected. 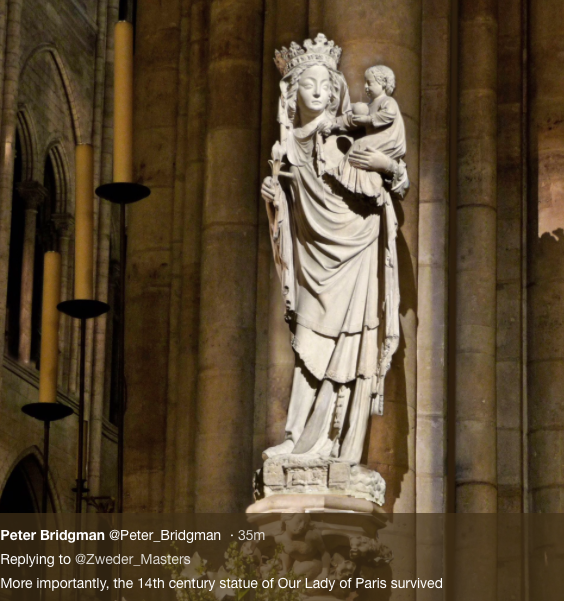 I've seen a famous and ancient church reduced to rubble, and once was enough. 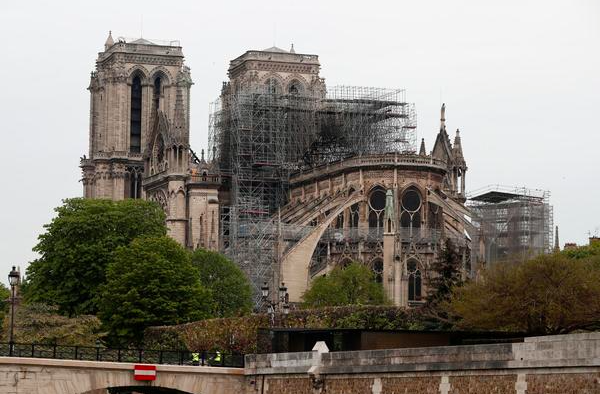 They have saved the greater part of the structure, including the two great towers. 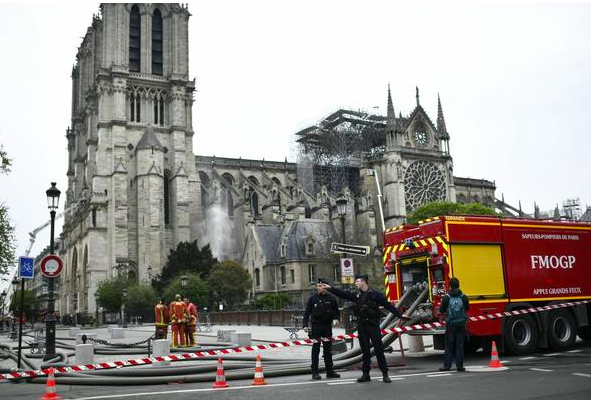 The stone vaults have held though the wooden roof burned and collapsed into the building. The principal movable treasures - first of which was the Blessed Sacrament - were saved as well. 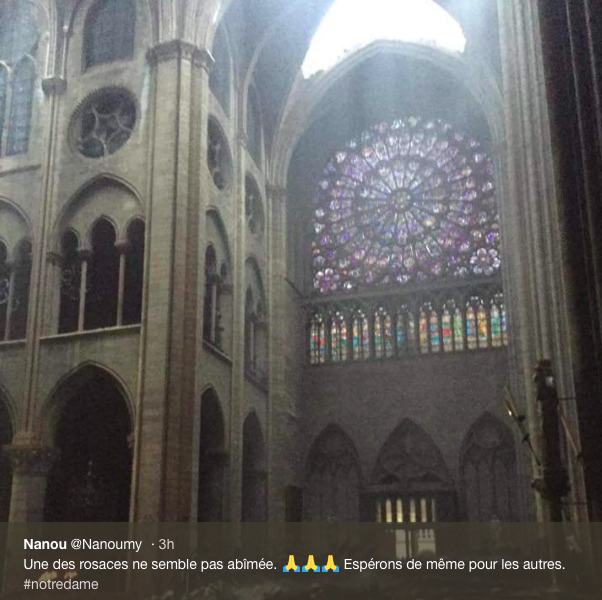 And perhaps most surprising is that three of the great rose windows have survived. Late last night. You can see at the very top that the fire is still not out. 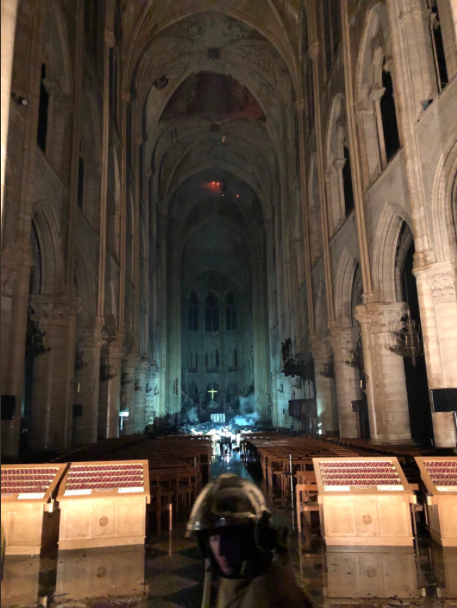 Symbolically, we have to know and accept that the corrupted thing, the offspring of the Beast, that has occupied and breathed its poisoned lies into this and all Catholic structures, has to be destroyed utterly and that much damage to what was good and dedicated to God will be done in the process. But Faith built this and all of Christendom, and Faith, even reduced, is unkillable. Praying for rain: why pray for things? Out the workroom window. Pouring. And kept on all night. A good solid downpour, soaking deep into the soil. Just what we needed, and started about 1/2 an hour after I prayed the Votive Collect for rain. Look for my upcoming 2-part thing for the Remnant on "Praying for things". How do we know our prayers are efficacious? If I pray for rain and it rains, doesn't that just mean that rain was coming anyway? And what are we to think when there is no apparent response to prayer? Or worse, what are we to think when we pray to avoid some bad thing and it happens anyway? How does the problem of evil relate to prayer? And, bonus round: what's prayer really for, anyway? Why pray at all, since God knows everything and already knows what we need? Most of the time, in our degenerate times, if people think of prayer at all they either have some vague idea about it, usually derived from nonsense New Age rubbish, that it's "Just talking to God," as though he's just some guy down the pub; or they just think that God is there to be asked for things, like a divine version of Amazon.com. This rather raises the question of what on earth nuns and monks do all day. When you ask them they say, "We pray." Yeah... but ... all day? Seriously? You don't run out of things to say? Prayer for most people is a matter of listing things to ask for. The Churched will perhaps add lists of things they think God wants to hear about their sins and failings. Most of this, as C.S. Lewis said, is "parrot talk" - reciting things they vaguely remember being told God wants to hear. So, what DO monks and nuns do all day? What does it mean to spend a lifetime pursuing union with God in prayer? 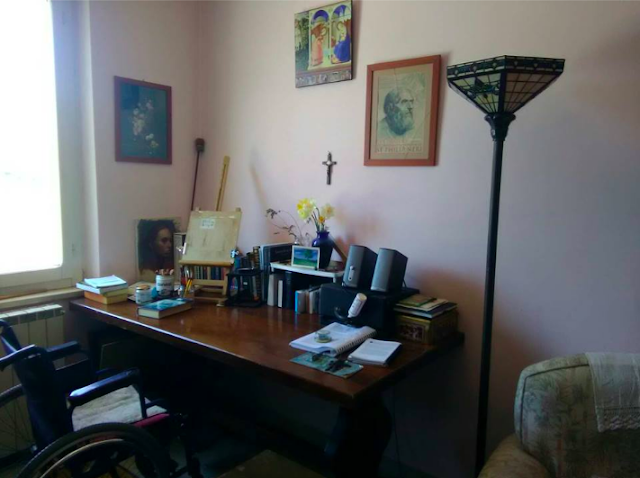 How do you get from the shopping list kind of prayer, or rote recitation of vocal prayers (a good thing, btw, and a necessary start) to the Ecstasy of St. Teresa? Even a very little acquaintance with the writing of the saints on mysticism will tell you that there's a good deal more going on with them and prayer than most of us are being told. There does seem to be some huge secret or mystery about it that we're no longer being told about. 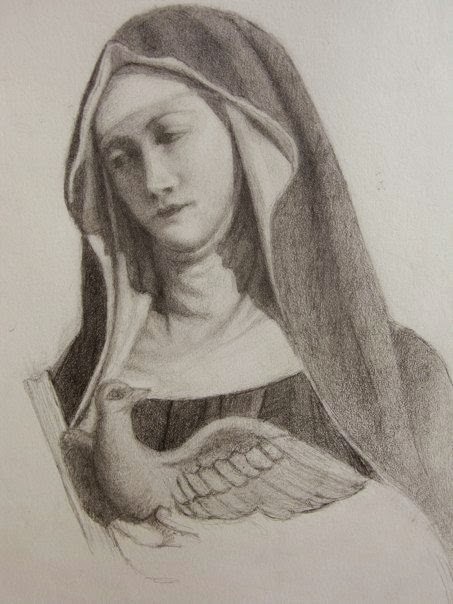 If mysticism is all based on prayer, then there has to be more to it than the parrot-talk. So, what is prayer, really? "In our better moments, we can see by looking back in our own lives how something that might have seemed bad at the time might have worked out to make things better, to make us better. So we extrapolate from that and say that even though we don’t know the logic of the greater good that comes from this evil, God does. Our answer is arithmetical, and God’s knowledge defies all our linear, merely arithmetical logic. "If we believe in God at all, and if we believe about Him what the Church tells us is true, that He is omniscient, omnipresent, omnipotent, then it can’t be otherwise since there is nothing “random” in His universe. The fact that He hears and answers prayer, all of which He Himself inspires in the first place, follows necessarily from His nature, revealed to us in Christ. "We are told to be confident in prayer, to come to Him in all necessities. But is this all prayer is? What if prayer for intentions, our own or those of others, were only step one in a much larger and richer divine scheme to bring us to Himself, in fact, to transform us into Himself? A daring thought." This is the tradition of the Egyptian Desert Fathers, of whom St. Anthony the Great, or St. Anthony of the Desert, gained the title, "Father of all monks". 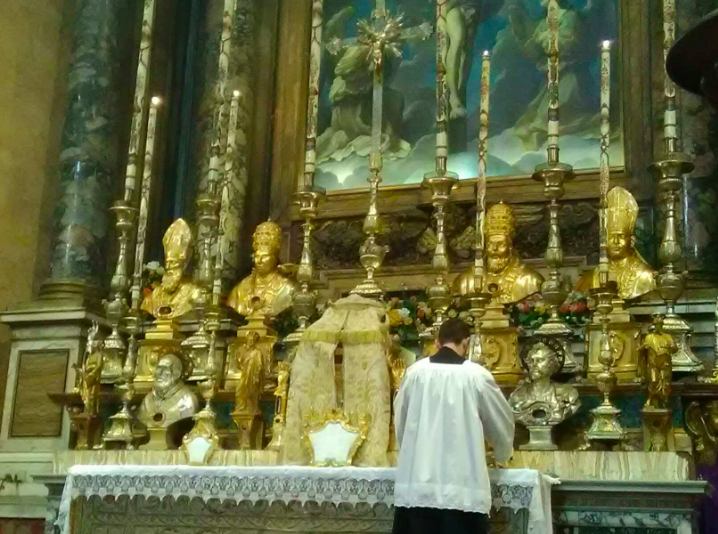 It was from this great well, springing up in the desert, that all the great gardens of the Church were watered by the endless river of monastic prayer and sacrifice, the "ascetic life." This life - monasticism - has been described by the great writers as the "combat of the desert" - and for the earliest monks it was single combat. It is, however, the same combat we all must undertake in the Christian life. We battle not only with the devil but with our own tawdry concupiscences, our temptations, our impatience, our bad temper, our lust, our selfishness, our own love of things that we hold above the love of God. The difference is that the monk undertakes to remove all obstacles - all distractions - that might take him away from it, or provide him with a place to hide from it. He goes out into the desert - whether metaphorical or literal - to force himself to confront his weaknesses, to remove all possibility of escape from the unpleasant work of stripping himself of his sins, faults and temptations. Where we have a million things in this life to think about that can shield us from the Living God, he takes all these away from himself, as an addict who wants to recover takes himself away from the neighbourhood of the drug dealers, or an alcoholic gets rid of the booze in his house and makes sure he doesn't go into a bar. This great river of the desert includes, much more directly than one might have thought, the stream of Benedictine monasticism that built Christian Europe. 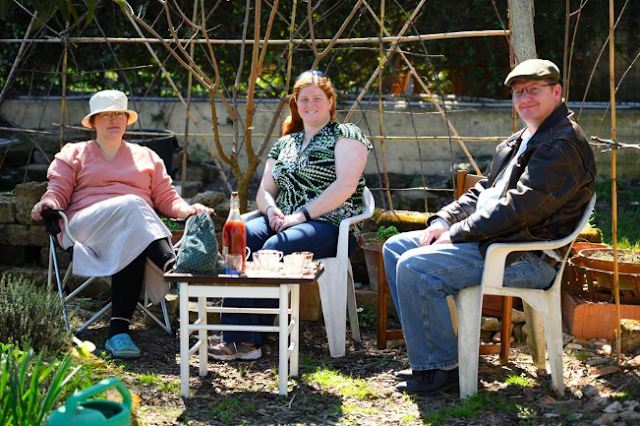 Today my longish first piece on the way this tradition was transplanted into Umbria and was passed on to the twins Benedict and Scolastica in the 5th century, will appear in the April 1st print edition of the Remnant. I've been reading a great deal about the very early evangelisation of Umbria - dating to the 4th century - and it's deeply moving and inspiring. A huge influx of refugees from Syria, fleeing persecution by monophysite heretics, came to Umbria then and established the same kind of monastic life here that we read of in the Sayings of the Desert Fathers - clusters of eremitical cells - little houses, really - a short hike down a trail between them, all overseen by an abbot. An "eremitical community" if such a thing isn't too contradictory. The story is quite extraordinary, and the moreso once you understand the influence these Syrian refugee hermits had and are still having on us today. 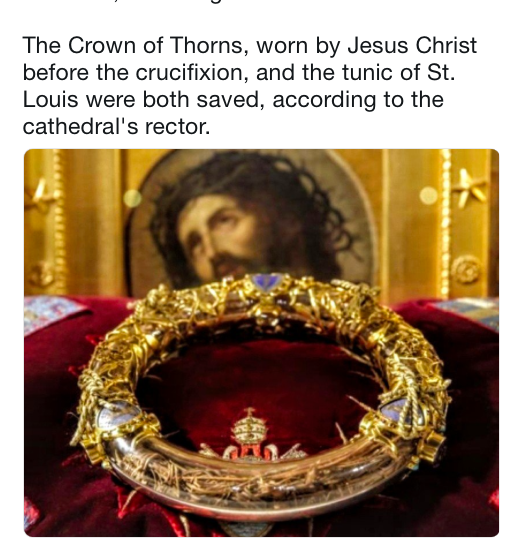 This was a time of massive, civilisational upheavals, when the great Christological debates were raging and Christendom was still very small (though growing rapidly) and in competition on all sides. The Empire was still strong (though now divided between Constantinople and Rome) but Classical Paganism was still followed by much of the ruling classes, and at the same time the Arian heresy was getting going. At this time no one in the Latin world had seen anything like this style of life. Even Augustine, who certainly was a Roman in the cultural sense, lived most of his life in North Africa. It was into this chaos - increased exponentially by the sudden appearance of the invading and violent pagan Goths (and not a nice kind of civilised Classical paganism - the Goths were German "barbarians" who worshipped some very dark things in very dark ways) - that these very early Syrian desert hermit-monks came to Umbria to live their ascetic, monastic lifestyle. Some of these monks eventually set up shop deep in the Sibilline mountains and ended up teaching St. Benedict and Scolastica - born 6 miles from their monastery - how to be monastic. It was from them, therefore, that we owe all of the later development not only of Western Monasticism, but of western European Christendom, since it is Benedictines who built all of Europe. If it is true what many people are saying, and that the collapse of belief - the general mass-apostasy - of the last 100 years has brought us right down to nothing, back to effective paganism, then we are in an analogous position now. And I am willing to bet that the same solution could bring about the same effect. This is the "luogo di silenzio" - the place of silence at Monteluco, a hill directly overlooking Spoleto. There is a Franciscan monastery there today, founded when the eremitical monks gave St. Francis of Assisi a little bit of land to build a few rough hermitages. The Romanesque church that St. Isaac the Syrian would have known is still there, as are a good number of the hermitages occupied through the centuries by his followers. According to the Dialogues of Pope Gregory I, the same document from which we learn most of what we know about the life of St. Benedict and his twin sister, one of these holy Syrian monks was St. Isaac, this time of the 6th century. Isaac, an orthodox Christian, was probably fleeing persecution by monophysite heretics during the reign of the emperor Anastasius I Dicorus, at a time when the eastern empire was under great political pressure because of the Christological controversies. 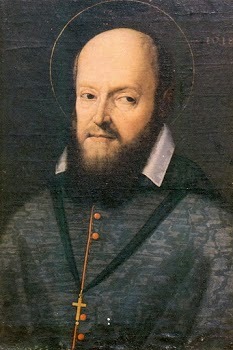 Gregory relates that when the monk arrived in Spoleto he asked permission to remain in one of the churches to pray. The wardens of the church allowed this and he remained, unmoving in prayer, for three straight days, at which point the exasperated officials removed him by force. One of these men accused Isaac of being a hypocrite, of wanting to be seen to be holy. This unfortunate man was immediately possessed by “a wicked spirit” and changed his tune when he asked Isaac to drive it out. 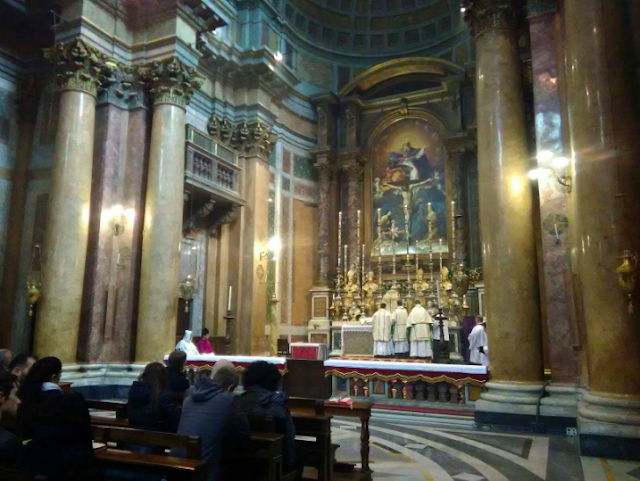 Soon after this exorcism, “men and women, rich and poor, came running,” each one imploring the holy Syrian to come to their own home, some offering money or property. Isaac refused all this and left the city, but didn’t go far. In 528 “he found a desert [solitary] place, where he built a little cottage for himself.” From this hermitage he performed miracles and demonstrated “prophetic” or miraculous knowledge and converted many of the still-pagan and half-Christian locals who “under his discipline and government, gave themselves to the service of almighty God,” in the religious life. Venerated in both the eastern and western Church as St. Isaac the Syrian and Isaac of Antioch, (d. 552) Isaac is sometimes also called Isaac of Monteluco, a still-extant hamlet in the hills above Spoleto where he had his hermitage and where there is a Franciscan monastery today. Some of the cave-like hermitages of this eastern-style community or “laura” of hermits still survive as does the Romanesque church dedicated to St. Peter which was given to Isaac to be the centre of his community. In its time and for many centuries the community was like a miniature version of the Holy Mountain of Athos, indeed it was called the “Thebaid of Umbria,” and the mountain is still revered locally as a sacred place. The laura slowly changed to become a true cenobium and later adopted the Rule of St. Benedict. These Benedictines gave St. Francis of Assisi a small portion of land to build a cluster of wattle huts for himself and his friars, which formed the nucleus of the current Franciscan monastery. But the eremitical life was preserved at Monteluco by the local bishops who encouraged the monks to form a formal eremitical congregation, which survived until 1795. This was before we had to capitalise that word to make distinctions. At this time it meant someone who refused to follow the Christological heresies of the time and retained the orthodox, Catholic Faith. The ferociously complex ecclesial and secular politics of this time can have an effect a person’s brain like that often attributed to a school of Amazon piranhas on a cow. Best leave it alone. 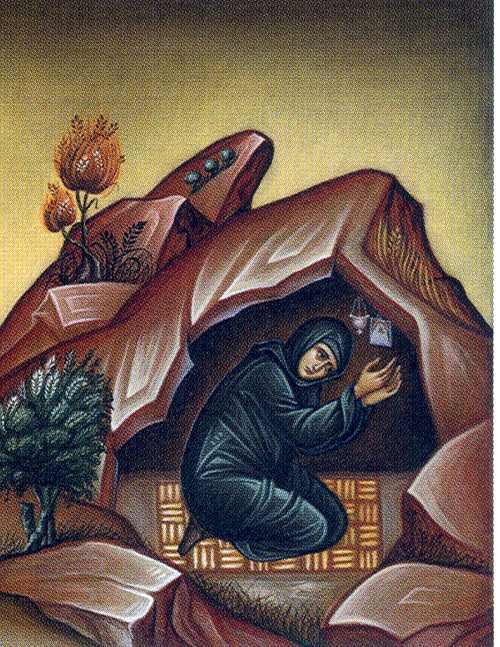 Cenobitic monks live in community, sharing work, meals and communal prayer, a later development from the original form of eremitical life of the Desert Fathers. The point isn't to get the stuff. The point is to do the work. People often say, "Oh, I'd love a garden, but the work!" The thing is, this is the wrong way to think about it. The work is the point. Americans have an odd expression: "yard work." And they use "yard work" as a way of punishing their children. This is not the English way of thinking of it, nor the Benedictine way. My grandparents regarded gardening as the supreme form of relaxation, and by this they meant relaxation of the mind. For the English, the garden, including the "work," was a place to escape to. The "work" - that my grandparents called "doing the garden" - is the purpose of it. In fact, this is about a perfect summary of what we're all doing wrong in the world. We think the point is the goal. We think the purpose is to get the stuff with as little effort as possible. This is the "transactional" approach to life; the attempt to get as much as possible at the lowest possible cost. But that's not how anything real works. The point isn't the goal. This turns "the work" into a burden you try to avoid. The point is to do the work. It's the work itself that produces the reward. For the Benedictine, manual labour is a great boon, a gift to steady the mind. While I was outside on the terrace all day yesterday, shoving pots around and building things, I found I'd created sufficient mental space to write, and finish the damn piece I have been working on for a week. I just can't write with the innernet buzzing away in my brain. I can't concentrate on anything, prayer, reading, thinking, while the world is shouting at me for my attention. 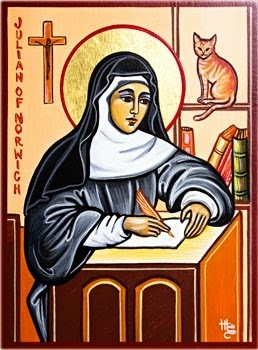 A Benedictine abbess told me once, "Oh, doing intellectual work is the most tiring thing. You need a garden to help you rest." Someone else asked me once, "How do I make the garden pay for itself in produce?" I found this question incomprehensible. "You don't. That's not what a garden is for." And it is funny, if that's why you're gardening. 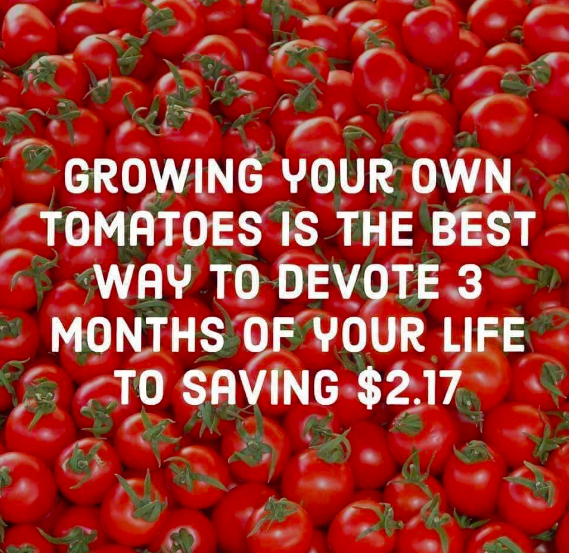 But I respond, as always, that I don't grow tomatoes because there aren't any in the shops. This is Italy, after all. We're not in the apocalypse yet. If I want carrots I can go to the shops and buy carrots. The garden is there for me. If it produces something I can eat, fine, but I need the garden itself a great deal more than I ever needed home grown carrots. People fear work, and avoid it. This is the modernist mind. We are surrounded by "labour saving devices" that have started running our lives for us. So we have saved all this labour so we can... do what, exactly? Plato's idea that you need a class of people who do no work so they can pursue things like philosophy, art and science is a major theme in the utopian dreams of people like Gene Roddenberry - all the smarty-smart, "advanced" utopian aliens all do nothing all day but play Vulcan harps and write poetry. They probably eat bonbons. What a crashing bore! What a smug pack of bastards the Vulcans are! Don't you mostly just want to punch them and give them something useful to do? Did you notice something about Star Trek the Next Generation? These were people desperate for something real to do. What did they do in their off hours? They wrote poetry and played cards and mucked about in their simulators, playing pirates. But like all these utopian ideas it doesn't work in practice because it fails to grasp that human nature is innate, and part of that nature is the need to work, to do things, particularly things with your hands and muscles. This is the great genius of the monastics; they fully grasp the subtleties of human nature in all its aspects, physical, mental, emotional and spiritual. My Uncle Mike, who gave up the kind of job you do wearing a tie to turn to the more satisfying work you do wearing gloves, put it very simply: "People like us need to work." And the big secret is that everyone - all humans - are the same in this way. And Modernia proves it for us. What do most of us do when we've "saved" all the labour? 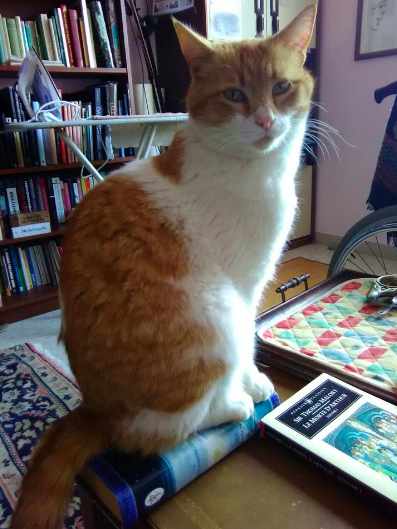 We're not reading great books. We don't write deathless poetry. We don't all create symphonies. Now that we've created a world where you mostly don't need to do anything at all, what do most of us actually do? Mostly we surf the net, and say nasty things on Twitter. Well DONe, humanity! 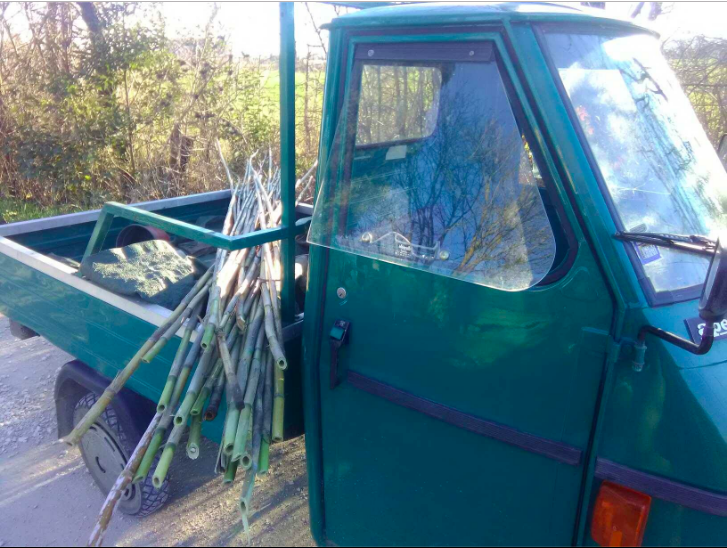 As for the simple fear of the labour in a garden tiring you out (when you get to a certain age, this is no longer a mere theory) I answer that, as my friend Janet said: "Two buckets a day." The trick is not to let the thought of the work intimidate you to the point where you don't do it for a long time. This makes it inevitable that you'll have way more work to do when you do work up the nerve, and that makes you exhausted and want to not do it again. If you go out and do two buckets a day, or divide the big jobs into lots of little jobs that you take in steps, it becomes a joy, and you see steady progress. This is they way my landlady Annamaria does it. It's just a normal part of her life, this daily visit of the garden and farm, the doing a little bit every day of every job as it comes up in the great cycle of the year. And I find that once I'm actually out there doing things, it's incredibly hard to make myself stop. For people who balk at the work, the answer is mostly just slow down. That you can't get to a mature garden in a single year. The answer is time. I wish it were possible to just buy a garden in a jar and pour it out and have it look like Bag End, but the main factor that can't be replaced with anything, not money, not labour, not nothing, is time. Watching the "making of" videos of LOTR, Peter Jackson, after having scouted the perfect location for Hobbiton, got the greens department working on it, and then let it sit and mature for nearly two years before starting filming. This really is why I want a place of my own. More and more I find that the thought of moving and shifting everything every four years (the normal length of a lease in Italy) is just increasingly unbearable. There's barely been time in three seasons here to get anything even started. In fact, it's only two really, since I wasn't able to get started on my patch until the end of the first growing season, and now will have to leave next April. Gardening gives you a different understanding of time. 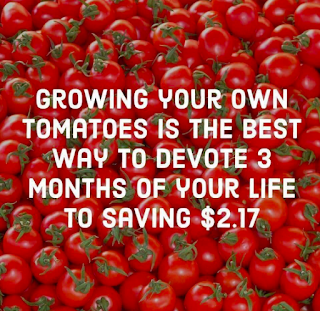 To the urban non-gardener, time is portioned out in minutes and hours. To a gardener, as to a monk, time is portioned out in seasons. I've been here since April 2017. That might seem like a long time to an urban person. To a gardener that's a paltry three growing seasons. The older and more hobbity I get, the more I find it is simply contrary to my deepest nature to be continuously on the move. Renting is akin to homelessness. But as a freelance writer, it's hard to imagine that I could ever have any hope of owning a home. Now, with all that, it's clouded over a bit and is supposed to rain tomorrow, which means it's exactly the moment to go out and dig a few more buckets' worth of the carrot bed. And I found a little stray morning glory seedling starting in one of the pots, which means its time to seed them all over. No shortage of these. I've got two big jars from last year. Don't you love before and after pics? This was the general mess of the terrace at the end of the first summer here, after a hasty and not very well organised retreat from Norcia. Fun and colourful in a chaotic way, but quite a mess. Here it is this morning. Strawberries and starter pots of sweet peas ready to go downstairs, pansies and herbs. 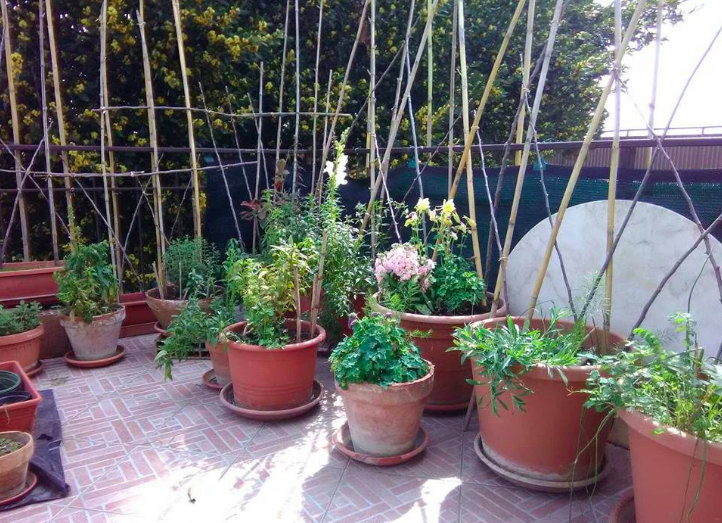 Sweet peas for the terrace, with their trellis, all ready to get going. 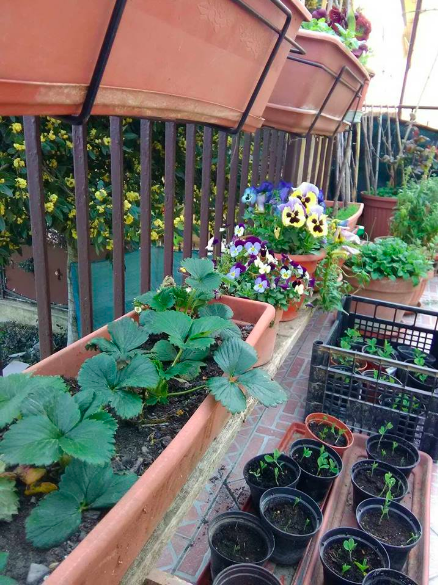 The Sweets will only last until about the end of June, and then we just collect the seeds and replace the dying plants with marigolds and nasturtiums, which can be seeded now. 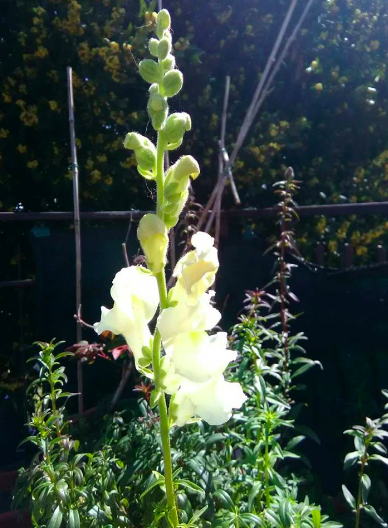 All the snap dragons are from seed last year. 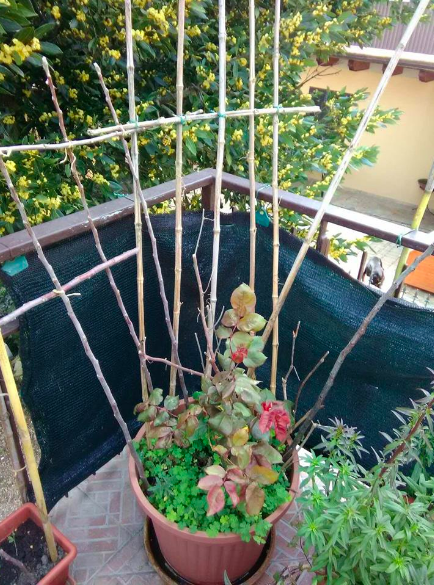 They lived quite uncaring through the winter ("winter") and started growing again in February. While they're amazingly robust growers, they're structurally incredibly fragile; just brushing by them carelessly will snap off the flower spikes. And I've learned that they don't like a small pot. Neither do the morning glories. They did all right last year, producing lots of flowers, but they didn't get anything like as dense - and crucially, as shade-producing - as they did in the garden with similar light conditions. So no more small pots and little planters for them. I'll seed them in the back row of big pots and we'll see if there's a difference. My last surviving rose from Norcia. It nearly died, and didn't respond well to being pruned in the autumn of 2017. It barely made it through last summer, hardly producing any new growth and not even a bud. But this spring in early February it started putting out leaves, so I hope it's finally over the moving shock. 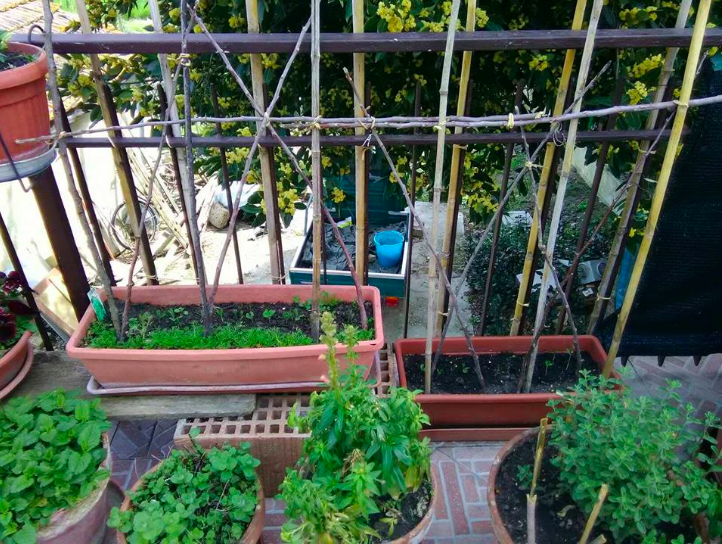 The trellis is for the passion flower vine - also a survivor of the move - that needed a good deal more support last year. Mad trellis-woman goes nuts! Quite a difference from the before pic. Going to have to go cut some more canes before the grape vines start. The fort-building part of my brain has been working out how to build a proper grape pergola, and I think I've got it. The advantage of having 20 inch thick stone walls is to keep the house cool in summer, and it does work. Unfortunately, it also means that the house stays chilly when it's nice out in spring. 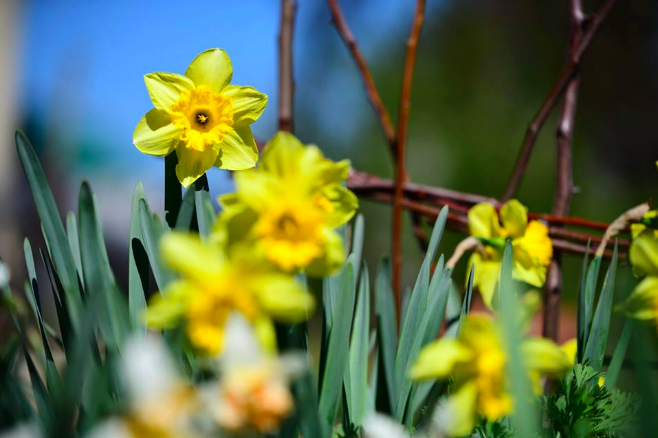 April 1st in the garden. When you just can't figure out what to do first, leave the house and putter about in the garden, where being disorganised and forgetful isn't really a high-stakes problem. 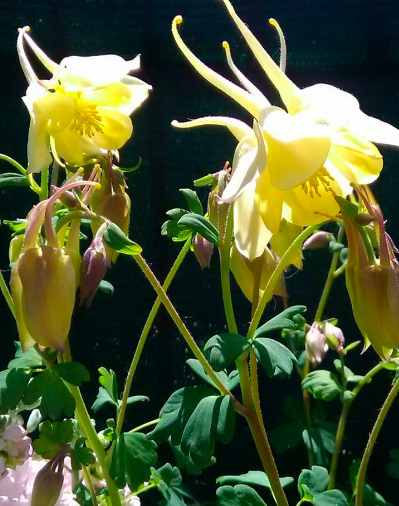 ...and as much sun as the sun-loving snap dragons and aquilegia want. 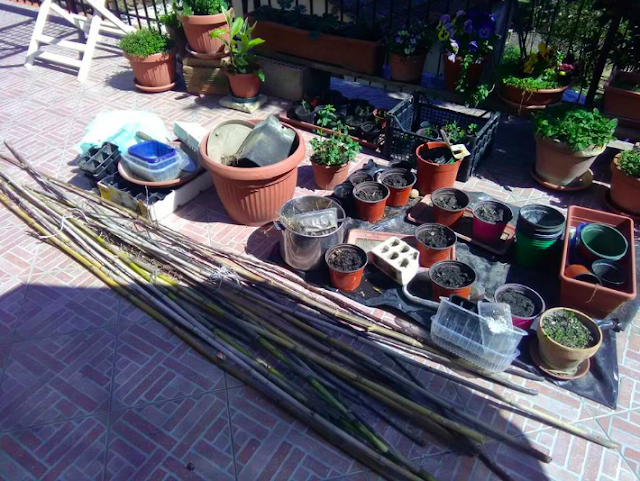 Sticks in the pots for the morning glories, that I should start seeding around about now. 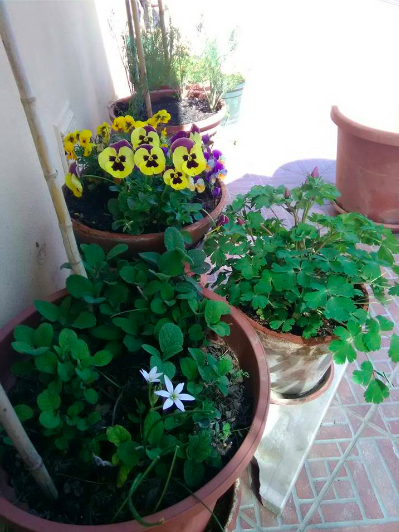 They do very well as long as there is a deep enough pot. They don't really have deep roots, and no tap root, but they didn't do well at all in the little hanging planters, so didn't produce the wall o'shade I was hoping for last year. 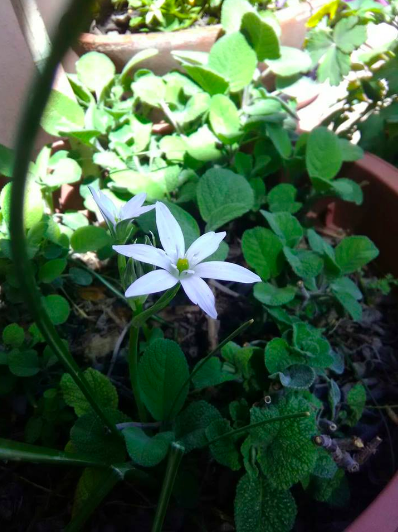 The little white flower is a wild bulb, called Star of Bethlehem, that grows all over the place, but I have no idea how this one ended up in my terrace sage pot. Gathering sticks and canes ready for the morning glory trellis. Too hot to do the work on the terrace in the mid-afternoon. 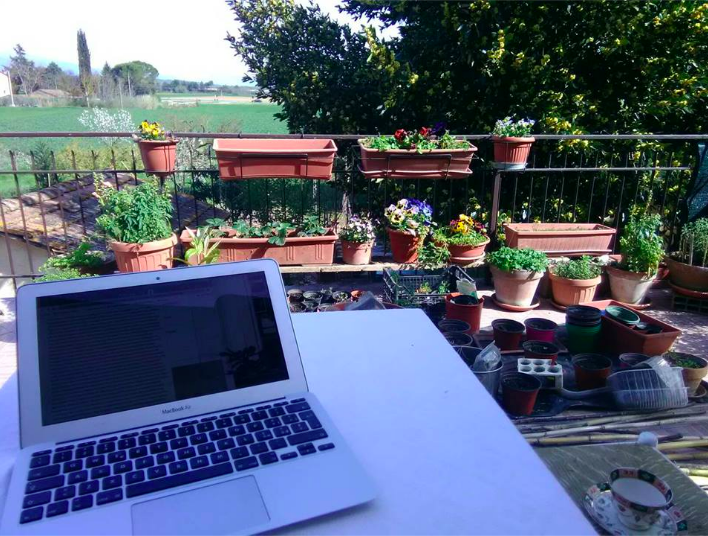 You don't live in Italy long before you figure out why everyone does their outdoor work in the late afternoons and early mornings. In the high summer, Annamaria comes over at dawn and is gone by nine am. I'll wait until the sun swings around to the west side of the house to put it up. The terrace always spends a few weeks in spring being a big higgedly-piggeldy mess, a pile of seed pots, soil bags, starter trays... I notice that Annamaria does her seedlings in the shade so I think I'll move it all down to the garden this afternoon. Midday is for hiding indoors. And maybe doing a little baking. 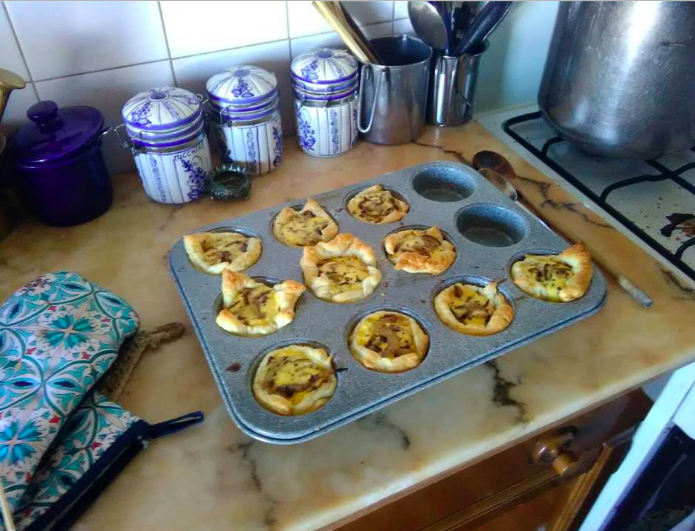 1 packet of ready-made puff dough from the supermarket. Caramelise the onions in a pan with butter. This just means letting them cook over a low heat until they start to turn a golden brown. Onions, surprisingly, have quite a lot of sugar in them naturally and they caramelise beautifully. While the onions are cooking, chop very fine a handful each of thyme, marjoram and a little sage, and throw these in with the onions when they're about half done and add a little balsamic vinegar, salt and pepper. 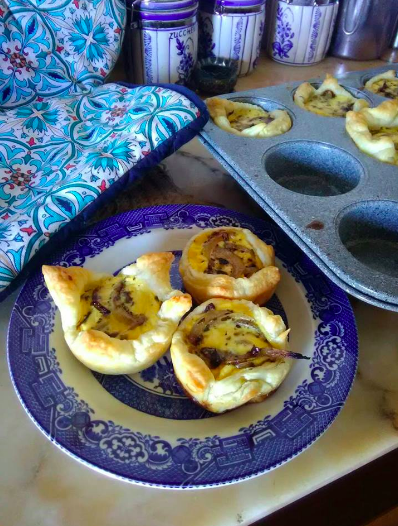 While the onions and herbs are cooking, cut out circles of dough and put them in your tart tin (like a muffin tin but with not such high sides). Place a little - very little - of the cooked onion mixture in the bottom of each tart. Whisk up two eggs and some milk as if you were making an omelette, and pour only a couple of tablespoons into each tart over the onion mixture. Bake at 200 C. for 15 minutes or until the pastry is turning golden. Some pics of the garden so far, and works in progress. The plum. Always the first to get started, it had been flowering for a few weeks when friends came over a week ago, and was getting past its peak. All in leaf now. 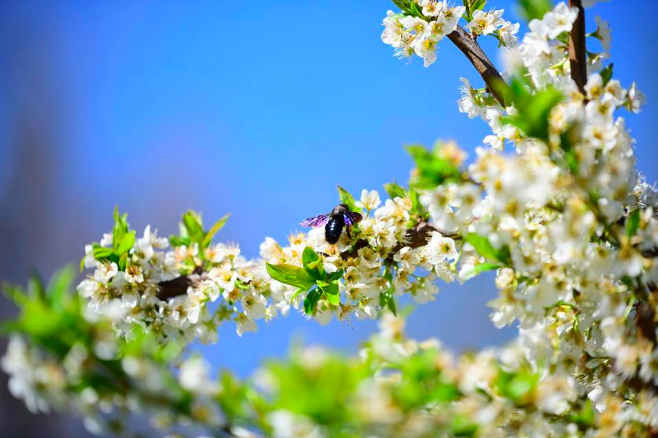 Blue carpenter bee, Xylocopa caerulea, that are the first to wake up in the spring. Saw the first one in early February. 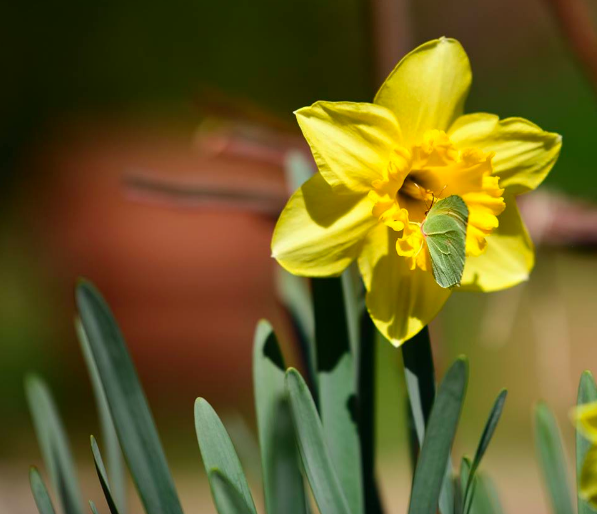 Added about 30 more daff bulbs this year. 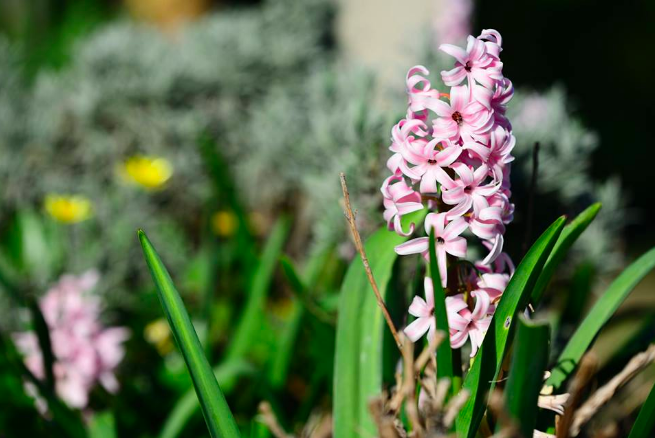 Annamaria's hyacinths. She cuts them and takes them to her mother's grave. 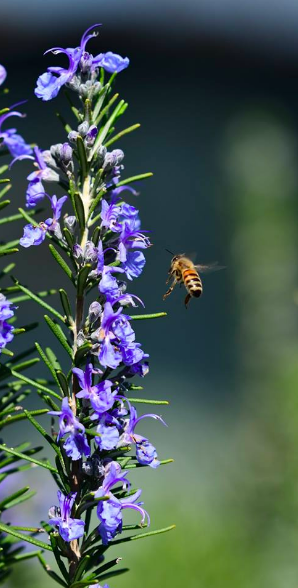 Rosemary flowers mightily early in spring and they are an important early food source for our bees. The rosemary hedge has been doing much better since Anna and I trimmed it way back the first summer. You have to get in there and cut away all the dead and dry stuff. These pics are not by me. Neither I nor my camera-phone are anything like this good. I'll have to invite Marc and Becky back in each stage of the garden's season to get decent pics of it all. Always more work to do. The day will never come when there's nothing to do in the garden. New onion bed. Onions coming up pretty nicely now, and I think I'll add some sunflowers, because, why not. Cutting canes. This was in February, so there are quite a few more now, and the ones that were too short are now big enough, so I think we'll go get some this afternoon. A massive issue in Italy is shade. 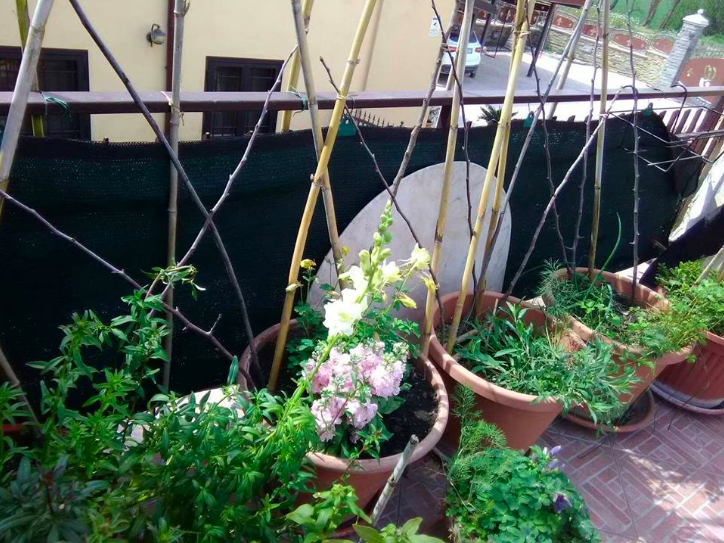 You do everything you can to create as much as possible, so I think more trellises are going up. And besides, it's fun to build them.